Me and my Little one absolutely Love this!! His absolute favourite sachet which actually tastes like real fruit, he could quite happily eat the whole thing and more. Its an ideal travel size which makes out crazy mum life a little easier! I would highly recommend to anyone with a little one whose just starting to wean! It is so smooth and sweet he lapped it up. Best price I have seen for a long time! Not really any, other then my one year old crie's when they are empty! This pouch is very handy for when you are on the go or for whenever you need a quick snack for your little ones. My eldest son (nearly 2) loves this flavour and devours it almost immediately. Great for storing in small spaces and it’s also great that little ones can’t get into the pouch itself as the lid can be screwed on rather tightly. Would definitely be having these with my youngest when he is ready for weaning. These are a great idea for when you're on the go and need something quick and easy. They can become quite expensive, but I would say there are more pro's than cons. Handy reusable cap. Easy for travel. I love the whole Mamia range! I use the baby milk. The snacks. The wipes. The nappies. The food. Also the baby wash and shampoo. I wish they had more choice and flavours. 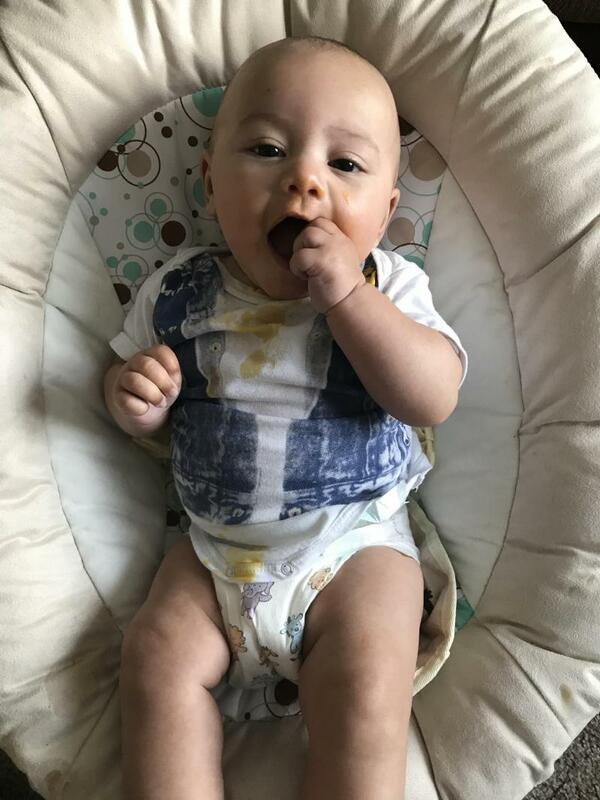 Perfect for babies easy to prep and easy for when out and about! Cheap enough for after lunch snacks too! Great flavour! As described! An amazing on the go or rushed off your feet at home product. Eaten hot or cold the babies don’t mind as they are yummy. Easy to warm up simply sit in a cup in hot water for a couple of minutes. I crushed up rusk and mixed it together to make a dessert for my boy and he liked it so much I had to go make more. I love these fruit pouches. Their extremely tasty my LO loves them she gets so exited I’ve also tried them their not bad at all! Definitely value for money . Such good value for money! Very yummy! Great for mixing with porridge! They should deffinatley do an attatchable spoon like ellas kitchen pouches. My little one Is a tiny bit unsure on trying all new flavours, but when i mixed this in with porride he loved it! I even tried it and can see why he liked it, the pouches are really handy as you can re-seal and pop in the fridge for the next day. Afforrdable. Great Taste. On the go packaging. I have had great experiences with all the Mamia food products, at such a great price range compared to other brands, whats not to love. The packaging is brilliant for making it easy to feed your little ones out on the go! 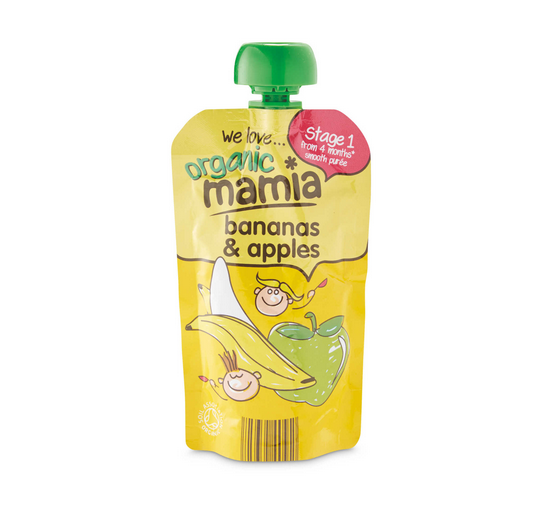 Being organic means no added nasties and little one must loves the apple and banana favouring as it goes down a treat each time. My baby loves this product and is one of his favourites. It's a good price too so win win win. They are useful to put into your bag for an emergency snack when out and about. It's a good start to the weaning process. Even my 3year old daughter enjoys them too. My little one adores this mix. It was one of the first fruity mixes we tried and she was shoving it in as fast as she could. She loves to dip her toast in it which means mess and fun but the flavour is great. Really tasty product that even I'd eat mixed with some yoghurt. My son enjoys these as his first tastes. The lid is resealable and it's a good consistency and flavour. Also even better value for money if you can pick them up at a baby event! Not any I can think of! My kids have all had them, and loved them. The babies will have them also when it comes to that time. They are so convineient, and quick and easy to use. So affordable and a lovely smooth purée which was one of Imogen’s first tastes! We love this! One of our daughters first tastes and she couldn’t get enough! The price is so affordable , and it’s so smooth it’s lovely mixed into porridge. A firm favourite ! I love these pouches , especially the banana and apples flavour. I mix these with weetabix instead of using milk and they're great for making it soft enough for baby and adding different flavours. My son doesn't like weetabix with milk so this makes for a great alternative and it's super quick and easy. They would also be great on their own! I will definitely buy these again and recommend to friends. My little one absolutely loves this! The price compared to other branded baby foods is just amazing! 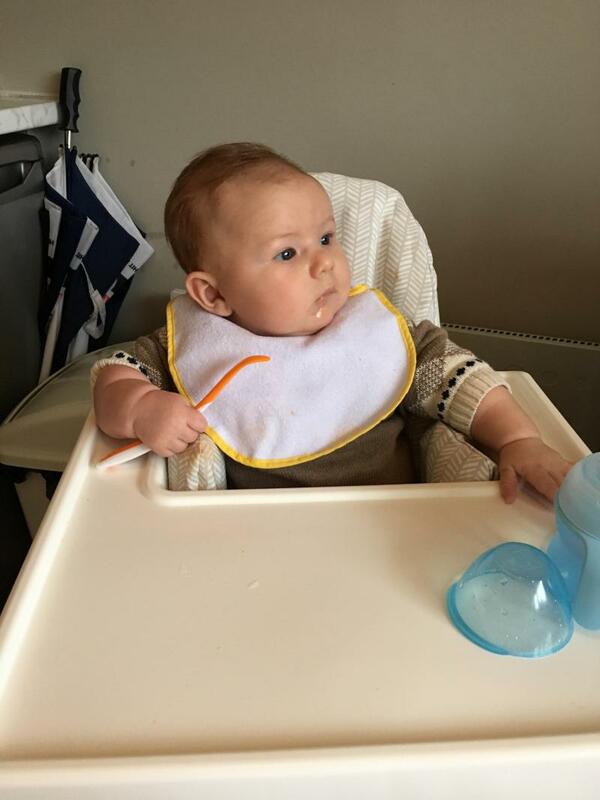 It’s great that they do them from 4 months as I had a very hungry little boy! Very tasty and would definitely recommend! 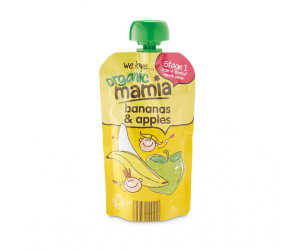 Mamia's Organic Banana's and Apple's makes for a delicious on the go snack. 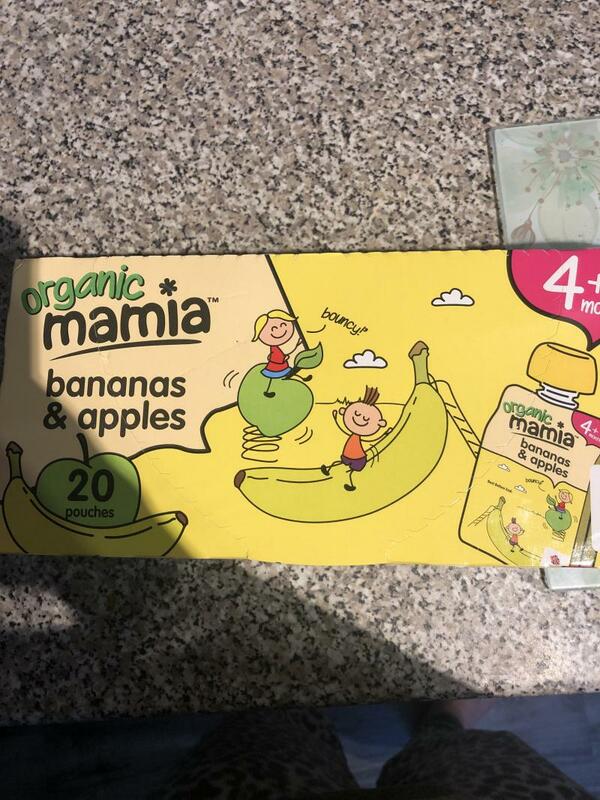 100% organic, the 120g pack contains a smooth blend of banana's and apples, containing no added sugar, thickeners or water. Suitable for children from 4 months onwards.